No walkthrough yet? Okie, in that case, I'll try my hand at one. To activate the topmost green square, click on both of the topmost circles. You need to activate all eight of the green squares lined up horizontally along the middle of the screen. Notice the lines that connect the green circles to the squares. Before you click on any circle, check to see if it's connected to a red square above the Explode Square. If it is, don't click on it if the other two red squares are activated. If it's not, you can click on it safely. You need to activate the Red (15) Square, which is connected to the Explode Square. This occurs when there are 15 activated circles. To activate a circle, just click on it. Red Squares activate when that number of circles activates. So if there are three activated circles, the Red  Square will activate. If there are ten activated circles, the Red  Square will activate. First, start with the bottom row. What are the only circles that will add up to 5 when activated? Next, look at the 2nd column from to the left. If you know that you can't activate (8) in that column, what are the only circles that will add up to 5 when activated? Next, look at the 2nd row from the top. If you know that (9) has to be activated, what are the only circles that will add up to 5 when activated? Next, look at the 2nd column from the right. If you know that (2) and (-2) have to be activated, what are the only circles that will add up to 5 when activated? Next, look at the 2nd row from the bottom. If you know that (-3) and (1) have to be activated, what are the only circles that will add up to 5 when activated? Next, look at the 3rd row (from the top or bottom). If you know that (4) has to be activated, what are the only circles that will add up to "5" when activated? Lastly, look at the right-most column. If you know that (-3) and (2) have to be activated, what are the only circles that will add up to 5 when activated? You need to light up all four Green Squares in the middle of the screen. You need to light up any of the four Red Squares at the top, bottom, left, or right of the screen. To light up a square (whether it's red or green) all of the activated circles that are connected to that square need to add up to the number in the square. Next look at each column, it appears as though each column has two numbers on it. If you click on the 3 in the first column, the top-most Green Square moves to column 3. If you then click on the 2 in the first column, the top-most Green Square moves to column 2. This looks like a classic Tower of Hanoi puzzle! There are lots of websites that explain how to solve the Tower of Hanoi better than I can. Just google "Tower of Hanoi"
You need to light all six Green Squares above the Disarm Square. This happens if you deactivate all of the circles. You need to light the Red  Square connected to the Explode Square. This happens if you click on any of the circles a total of 42 times. If you click on a circle, that circle, and all of the circles to the right, left, above, and below that circle get activated/deactivated. Start by deactivating the two circles in the left-most column by clicking only on the two circles to the right of those circles. Next, deactivate the four circles in the second column by clicking only on the circles in the third column. Keep working your way down the columns until you've deactivated all of the circles. X stands for the circles you should click on ONCE, and O stands for the circles that you should never click on. If you click on a Green Circle, you will move the square in the row that the Green Circle is attached to. So if you click on the Green (1) Circle, you'll move all the squares in the attached rows 1 space to the right. If you click on the Green (-2) Circle, you'll move all the squares in the attached rows 2 spaces to the left. That's all the help I can give. The rest should be able to be solved via trial and error. Try reading the waiver that you sign at the beginning of the game. It'll hurt your eyes, but it's funny! Can someone explain the rule for what makes level 5 explode? I don't how what I keep doing to cause an explosion is adequately represented by the bottom diagram. Oh I see. I'm not sure that diagram was the best way to represent that. can someone explain level 5? (M) I've been tinkering for a while now and I'm honestly stuck. On level 5, moving a green box into a row when there is another green box that is higher than it causes an explosion. It's a real pain to get past. I hear the cake is a lie. This seems like a good idea squandered in poor presentation. With the help of a whole forum of people, the young developers didn't notice the word "reply" substituted for "replay" in the main menu? It's these sorts of details, or more accurately lack of attention to details, that makes this game suffer. It's been thrown together on a shoe-string budget to be sure, but that doesn't excuse lazy design. It reminds me of the meat and potatoes analogy; the meat and potatoes may be present in this case, but alone they are rather boring. They misspelled "proceed" at the end as well. You can't move pieces to underneath other ones. So you can't move a piece to a column if there's already a piece there in a higher row. And of course, it always the topmost piece in a column that is moved. But once you know what the rule is it's quite easy to solve. Just an odd Tower of Hanoi. But I agree that the diagram wasn't clear. Agreed on the poor-presentation reviews. I'm frustrated with Level 4 right now because every time I die, the giant "RETRY" button covers the entire puzzle, making it impossible to see what exactly I did to botch the puzzle. Is that really necessary/thoughtful design? Alright. So Level 5. Let's give a few guiding hints. First things first, the buttons we can use. Random pressing betrays that the top light in any column is what moves. The buttons that we have are numbered. What could those or the numbers above each column mean? Each button moves the top light in the column to the column that matches its number. Look at the diagrams. A little thought reveals the logic behind them. Some sort of before and after relationship, yeah? Okay, so the after state is when any green lights are in the same column. So what's this mess with the before state? The before states describe two possibilities for lights to move forward. The top one shows when a light above another light moves forward to meet it. We like this. The bottom one shows when a light below another light moves forward to meet it. We do not like this. Now get all the lights to the third column. Anyone have any hints for room 7? light the boxes up in order. stuck on lvl 7 (S), anyone got the systematic? Help with #7. Can't figure out the rule to light 1,2,3 boxes along the bottom. Talkin' bout the ending, don't click if you don't want to know! Last level doesn't have a solution. Alright, finished it with no help. Woo hoo! Probably a first for me. Read the notes about leaving comments at the bottom for how to leave spoilers. Basically put html-like "spoiler" code around some text. level 6... i keep on ending up with only one left and try as i might i can't get rid of it. help please? I got most of them so far without much help (minus the "Towers of Hanoi" one), but I just have no clue what to do on level 8.
clicking on buttons 1, 8, 9, 10, or 15 results in death any time you click on them. You have to make all four lights light up column 1 first, then all four light up column 2, then column 3. You can step the lights forward and backwards using the number buttons. If you allow the lights to fall off the ends, on either end, you explode. I solved this by cycling through each light, going "What do you need? You need to move forward one step, and your two available steps are +2 and -1, so we'll do that. Next, what do you need?" Two or three cycles of that got me to each row successfully--brute force is definitely the way to go. I'm not sure if it was coincidence, but it seemed like my last step on each of the three set-ups was always the +2 yellow line. 10 deaths. I groaned when the last level came up, and actually expected the game to be over at that point. Some of the levels (#4 and #7) were pretty clever, but a few (#5 in particular) felt a bit forced. but I think I was called away to do something else while I was considering. I just wish they paid more attention to their spelling and punctuation. Not a brilliant game, but not terrible. The food is a lie. Also, stuck on level 4. It's the Königsberg Bridge Problem! I can't be the only one who got stuck on level four, then wrote a program to crack it, right? Anyway, it was an interesting and clever game, I just wish there was more of an effort in presentation. hey everyone. I am the "crafty development team" behind Defuse. let me start by saying, I'm glad everyone liked it. This was my first game, so I'm glad its going so well. Dora was on target when she said "the sparse design doesn't allow for much other than the series of increasingly tricky puzzles." I wanted to create as pure a puzzle experience experience as possible. I find it funny that on this site, my game got "Amalgamated Research Group" appended to its name. originally it was just titled Defuse. I personally don't mind but I wonder if "Amalgamated Research" cares (google them). xkcd was used to help design level 6(I number the levels 0-8) and for play testing. if this forum allowed links, i would provide them. Some of you got stuck on level 4 and on 6. There were a few sticky points in level design caused by the lack of real directions. So don't feel bad. One of the main principals behind this game was that the "conventions" would tell you how the level works, sort of like an unwritten language. Sometimes this works better than others. one of you complained about the retry button blocking things. This was laziness on my part, in some levels the puzzle resets the instant you die so you couldn't see what you messed up anyway. I used the retry button to literally hide this fact. I guess some of you noticed that I am clearly the first person to ever misspell something on the internet such as reply/replay and procede/proceed. oh well. small errors happen I guess. One of the things that annoys me is that I forgot to change the font on the last level (compare it to the previous level). since these things don't effect game play, I'm not going to go through the trouble releasing and distributing an updated version. sorry. for those of you interested, font of the logo of Amalgamated Research Group is called 7th service. Beat it. No outside assistance, not one death. Meaningful looking nonsense. Looks very convincing but has no actual value to it. Good luck trying to read this nonsense. Hey I guess if you zoomed in you just found an easter egg. Don't you feel special. FYI this font is advertised as the dame one used by Guns 'N' Roses. Pretty cool huh. Well anyway you should get back to the game. Its kinda weird that you bothered to read this anyway. I made it illegible for a reason. It's not like I'm taking your inalienable rights by having you sign something in a videogame. Weird a** mifl. Well good luck. The text telling you to check the previous puzzles is a clue. From the second one onward, there's one letter in each puzzle spelling out "PRIMES". So 2, 3, 5, 7, 11, 13. It wasn't long before I realized the "crazy text" wasn't kidding: the puzzle really is impossible. Any hints for Level 4? It is about to drive me insane. I figured out 6 two seconds in. to solve, though? Look around, are there any buttons that cannot ever be pressed? Yes, the two -3 buttons. You cannot complete the 4 if either are pressed. The 4 is the most limited button, you can only complete it two ways. Try one, then go around. The 3 needs both 2's and a one. The 2 can be beat with just the -1. Then the 3 needs a 2 and both 1's. "(I number the levels 0-8)"
Ahh, spoken like a true programmer. Dora, the link to XKCD may warrant a rating-y on the review. I love XKCD, but it's not 100% child friendly. Thanks, LSN! Rather than change the rating of the game itself, I just changed the first paragraph slightly and tacked on a warning for the site only. Very good game! I love these puzzles when you just need logics to solve them. I actually like the design. No extra "fluff" to distract you. Big props to the developer! Oh, and the ppl who complain like little children about spelling mistakes. I don't know if you got pissed because the game was too tough for you or what the problem is. If your intention was to simply be nice and inform the developer, there are nicer ways to put it. As other commenters said, you have to light up the boxes marked 1, 2, 3 in order, without ever letting the red lights go "out of bounds". The method I used is probably not the most efficient one. 3, 2, -2, 1, -1, 2, -1, 3, -1, -1, 2, 2, -2, 1. Press -2, -1, 1 (not necessarily in this order) and then repeat the same steps done for #1. Once more use the same steps as #1, but note that this time you have to press them in a different order. What I did was going through the list and checking whether the next move was safe. If it was, I would click the number and cross it off my list, otherwise move to the next one. At the end of the list, start over with the numbers that still aren't crossed out. Foolproof, apart from the 2/3 times I misclicked and had to start over. "Oh, and the ppl who complain like little children about spelling mistakes"
That seems a bit rude to me, "there are nicer ways to put it." I didn't like the game. I believe a great game is a combination of fun play and deft presentation. This game offers some decent logic puzzles but the presentation is lacking. I am not suggesting the developer is stupid or that I don't like him. I just thought what was a good idea could have been much better. Is that such a horrible thing to say? Anyone who develops games (or does anything creative and publishes it) is facing an uphill battle on the internet. I realize the constant stream of complaining on the internet can be like white noise. But at the same time, don't get angry at the critics for criticizing. I am but one voice in a sea of voices, both positive and negative. If the developer chooses to ignore me (or others like me), that's his prerogative. I harbor no ill will toward him, I just thought this game could have been better. So IIAOW, I wish you the best of luck, and I hope to see future work from you. Prawn, I hope you'll realize I am not trying to be mean, just honest. Omgosh, from the guys who made XKCD? Man, I love that comic. There's a 90% chance anything related to it is totally awesome, as shown with this game. Okay, level 5 is not too difficult, but trying to use the interface for it is worse than reading YouTube comments. I know what has to be done, and I've done this sort of problem before, but the buttons have killed me about a dozen times now when I get halfway through just because of the poor design on the level. Love the game, though; just this one thing is immensely frustrating. I figured out a simple algorithm (absolutely no math involved) some time ago for solving the Towers of Hanoi puzzle in the minimum possible number of moves. I'll put it in spoiler tags because it's kinda long. Number the discs starting at 1 with the bottom disc. Label the towers A-C starting with the left tower. Also, think of the towers being situated in a circle, so that "moving a disc left off of Tower A" means moving it onto Tower C, and the same goes for moving right off of Tower C.
So in order to solve the puzzle, you have to at some point move disc 1 from A to C. This action means moving disc 1 left (since "left of A" means tower C). Knowing this, you should now think of all odd numbered discs as left-moving, meaning that they can only move left, and all even numbered discs as right-moving. From here, the puzzle practically solves itself with the added condition that you never move the same disc twice in a row. At any point in the puzzle there will really only be one move you can make. (I've left out the tower labels because they don't line up in this font). And now the only move you can make is to move 5 left onto Tower B. Again, remembering that you don't move the same disc twice in a row, the only other disc that can move is disc 3, which is left-moving because it's odd, so that goes onto Tower C. Then the next moves are to move discs 5, 4, then 5 again so that 3, 4, and 5 are all on C.
Continue doing this, and you've solved the puzzle! 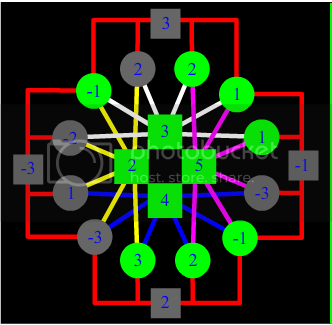 This algorithm works for any number of discs. I've split the moves into lines where the first move on the line is when a disc is moving for the first time because this reveals the recursion. Notice how each line starts with a new disc number, but then the rest of the numbers on that line are simply ALL of the numbers from all of the previous lines in backwards order. @lSN I like your solution to the towers of hanoi problem it is very simple and easy to remember. This solution uses the fact that you can move all 4 squares either forward or backward by only using 2 buttons per direction, and without affecting any square that has already been moved. The solution works by getting all 4 squares to the same point and then moving them back the necessary amount of spaces, moving some of them an extra space forward if necessary. But because of this, after having lit up a square it is necessary to move the squares back to their starting point.